©1998-2011. The format of this website and all original statements and narrative included on it are copyrighted and all rights are reserved. Factual information may be freely quoted for use in private genealogical research when accompanied by a full source citation, including the date of acquisition. 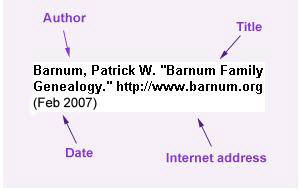 Click here to view the format of a citation for an Internet resource. The publication of large extracts from this site in any form requires prior written consent.